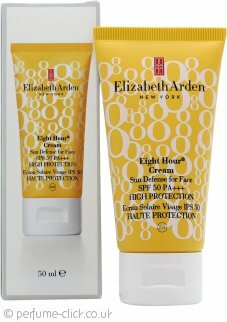 Elizabeth Arden Eight Hour Cream Sun Defense For Face is developed to protect your skin against the harmful UVA/UVB rays that can cause sunburn, skin cell damage and premature signs of aging. •	Hydrates your skin for up to 8 hours. •	Protects you skin against sunburn, skin cell damage and premature signs of aging. •	Has a powerful SPF 50 protection. •	Has the Skin Cancer Foundation Seal of Approval. Apply liberally and evenly to face before sun exposure.